I was recently asked by one of my Face Book friends on any tips I could give him on teaching. It seems he will be tackling his first class as a teacher at the end of the week. It got me thinking of my experiences over the years. I can still remember my first classes and how nervous I was. What I want to provide is a general outline that new teacher can use to teach their first martial art classes. There are of course a ton of variables involved in presentation and that is what some people are gifted and others are average. In my experience, teaching can be a learned skill, refined through time. I have also observed that some people are natural leaders and orators. This goes FAR in the realm of martial arts. When first taking the journey down the teaching road, you will be nervous. This is natural. Dont think you are the only one who has felt this way. This is what you can do to prepare for this job. 1) Prepare an outline: Take note how long your class is and write down the techniques you PLAN on teaching in your class. Always have more than you could possibly teach in a given period of time. This will allow you to fall back if you happen to get through a lot of what you wanted to cover. 2) Keep it simple. While you may love the rubber guard, x guard or some really cool move or combo, keep you lesson plan brutally simple in the beginning. It will keep your students from asking too many questions which you yourself may not know. 3) Dont teach something you "kinda know" or "saw one time on you tube". Youll get crushed right in the middle of the technique and realize you really dont know it. Your students will suffer for it. 4) Chain you techniques so they make LOGICAL sense to the person learning. Showing a guard break and then flying arm bar right after it will show there is no theme. A Theme is important when you are a "white belt" in teaching. As you get more experienced, you can mix and match and make anything make sense. But this takes time! 5) Speak slowly and clearly. Know where your audience is and make sure they can SEE what you are doing. Dont take for granted that they will get it. Use your verbal skills to further explain what you are doing. Dont rush. Breathe. When I let my blue belts teach a move for the first time, their voices quiver and they speak too fast. 6) Ask your students "do you have any questions?" It will help you refine your skill. 7) Dont be afraid to say " I do not know." This is alien to many people because they dont want to appear weak in front of their audience. Let me tell you something: Not all teachers know everything. However, the GOOD/GREAT ones can trouble shoot right away and figure it out. That takes time...lots of time. It wont come over night. 8) Dont be a robot. Nobody likes listening to a drone with no inflection in his/her voice. Humor and animation goes a long way but this is something you cant fake. That is why some people are naturals and others are not. I have seen world champs who couldnt teach. 9) Be warm and engaging. After you show your techniques, go around and help your students. Make sure you know their names and make your interaction personal. Students will appreciate this. 10) Call them back and show the technique again (and again) if there are problems. When I observe my classes, there are often the same mistakes being done by multiple students. Instead of going around to each one,call them back and show the technique again. It may require you to teach the technique in a DIFFERENT manner. Remember that each person learns differently. Some visual, some audible, some kinetic. I will often tell my students to totally ignore everything I am showing but one part. I will say "everyone just watch my left leg and what it is doing in this movement." That way, they focus on a subtle detail and arent overwhelmed with a bunch of moving limbs. 11) Advanced: As you get better and spend more time teaching people, you will become flexible. I no longer use a written syllabus when teaching. I go in and just do it. And I love every minute of it. Each class is different. Different students, different dynamics. If all my blue belts showed up, I may get crazy and start doing some advanced stuff. My mother always said " know your audience"! True and dynamic teachers are FUN to learn from. That makes retention better. That also makes students want to come back and learn. It is a wonderful cycle that you will benefit from! I knew at 10 I wanted to teach. 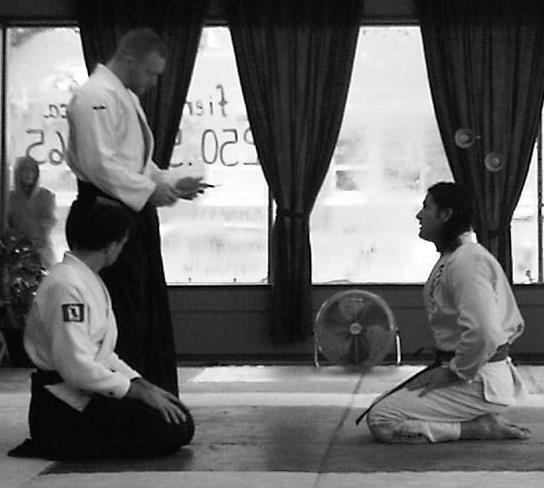 I thought I was going to be a high school teacher but my fortunes pushed me to combine my love of martial arts and teaching together. Having spent thousands of hours teaching students and also in front of a video camera, I have had the chance to observe myself over and over. Every TIME I teach, I review in my head after how I can make it better. There is no limit to how far you can advance. You should also take cues from those teachers you admire or like. We all have aspects of our teacher in our own teaching ability. We then add our own personalities to the mix. This entry was posted on Saturday, December 10th, 2011 at 4:35 pm and is filed under Articles. You can follow any responses to this entry through the RSS 2.0 feed. You can leave a response, or trackback from your own site.